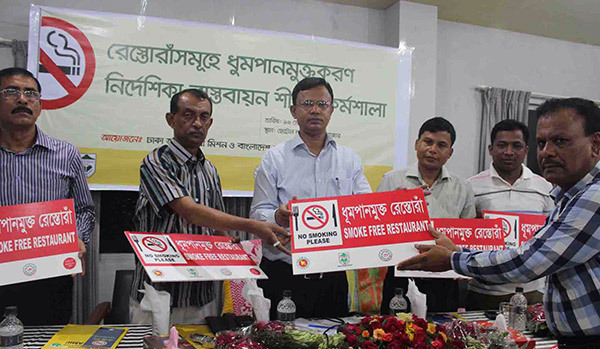 Bangladesh Restaurant Owners Association (BROA), Dhaka Ahsania Mission and YPSA jointly arranged “Workshop on implementation of smoke free guideline at restaurants in Cox’s Bazar on 19 May 2014. District Commissioner (DC) of Cox’sBazar District said that a letter would be issued soon to the all restaurants for keeping their restaurants smoke free” while he was present as chief guest in the workshop. The program was presided over by Alhaj Abul Kasem Sikder, President of Cox’s Bazar Restaurant Owners Association. He committed that all restaurants of Cox’s Bazar would keep their restaurants smoke free through implementing smoke free guideline. Mr. Chatra Dhar Tripura, ASP of Cox’s Bazar district, Mr. Jisan Uddin Jisan, Panel Mayor of Cox’s Bazar Municipality, Mr. Rezaul Karim Sarker Robin, Secretary General, Central Committee of Bangladesh Restaurant Owner Association (BROA) and Mr. Taufiqul Islam, Treasure, Central Committee of BROA were presented as special guests in that meeting.